Card: 25 spaces grid, with an already filled space in the center (FREE Space) and 24 numbered spaces so the player can mark as the numbers are drawn. Power Ups: Specific elements that can haste your plays or make your game better. We will talk about them further. The players choose individually from 1 to 4 card to use in the game. Each round, a different number is drawn. If any of your cards has it printend, you can mark it. 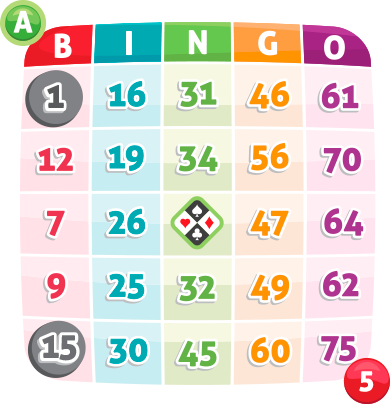 As you complete a line, column, diagonal or a star pattern, the player only needs to call Bingo and will be included at the prize pool. 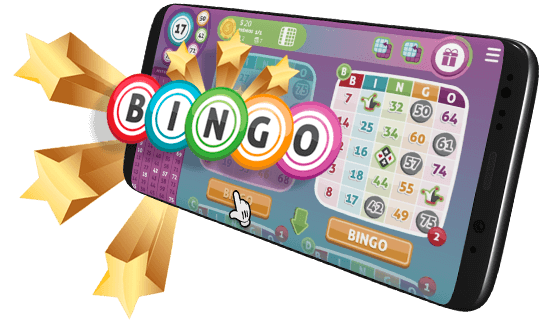 The Mega Bingo Online uses 75 numbers, with groups of 24 numbers per card (5 numbers per column) divided through B, I, N, G and O columns. Each card is unique and has 24 aleatory numbers, with a range from 1 to 75. "O" from 61 to 75. The cards have 25 spaces, with 24 spaces filled with numbers and a "FREE" central space, automatically marked by all players each round. All other spaces must be marked as the balls are drawn, in a way that a line, column or diagonal is filled. 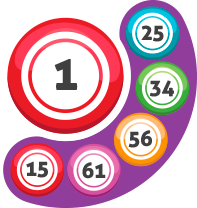 To mark each drawn number, just click it and it will be selected. To change between your purchased cards during the game, just click the green arrow. Look for a red circle on the bottom of each card. This indicates how many of the drawn numbers are left to be marked on it. An random number (that wasn't drawn yet) of each card turns into a marked number. Exchange your card for a new one with the drawn numbers already marked. You choose any number that wasn't drawn and mark it. In this card, the numbers are presented in a random order . Special card with the numbers ordered in an increasing order. Buy up to 4 cards to contest all the accumulated prize pot. There are special cards with ordered numbers that can help you win. Click the card numbers to mark them, use the arrow to see your other cards and stay tunned for the called numbers, since some ability is needed to recover the missed numbers. The Power Ups balance the dispute for the prize and even if you're not going that well on the round they can take you back to the game if used with strategy. If you marked right, make haste and click the "bingo" button to claim your prize. Completing lines, columns, diagonal or a star pattern are the ways to win. Amplify your knowledge at Board Games reading the rules and watching videos from similar games to Bingo .